During the celebration of Canadian Library Month in October, Seniors Week is an opportunity for public libraries to focus on programming, services, books and materials for seniors provided by the nine public library regions in Nova Scotia. Throughout the year, library staff continue to welcome and serve older adults coming to the library. Seniors Week is a provincial initiative to incorporate library promotion and engagement of seniors within our communities. Public libraries are encouraged to engage with our seniors and work together to provide for their needs. National Seniors Day will be celebrated on October 1, 2016. Provincially, Seniors Week will be celebrated from October 1 - October 7, 2016. This year the theme is 'Sharing Stories ... discover your community'. Library branch staff have been creative in programming ideas this year. look for a presentation on Charles MacDonald and his Faerie Cottages, Positive Approaches for Dementia, Conversations About Death and Dying, Rug Hooking, Card Making, Celebrating the Harvest Season, a talk on the book 'Valley Child: A Memoir' or come to an Old-fashioned Kitchen Party. For a complete list of all programs go to the event page on our website: www.valleylibrary.ca/seniors-week. Registration may be required for some of the programs. Browse our online catalogue for some interesting reading material and check out the creative displays of items chosen by staff at each of our branches. This may also be a good time to celebrate our senior library workers! Patrons often ask if we have a list of what they have read. Our answer is no, we only have a list of what you currently have checked out. Did you know that you can make lists of books and store them in your Annapolis Valley Regional Library account? To do this you first log into My Account. Then click on the home button for Your Account in the top right corner. On the left hand side you will see a block called Your Lists. Under Your Favorites, you have the option to create a list. This could be a list of cook books, crafting books, novels, DVDs, books you have read or would like to read, whatever you like. For example, I made a list of suggestions from the Book Lovers Calendar. It was great to know that of the 29 titles I added to my list, only 3 were not available in our system. They were, however, available from other Libraries in Nova Scotia. To do this for yourself: search for a title, when you find it press "add to favourites", then choose the list. Once these lists are created, they can be modified. You can add your own notes to the title, saying for example when you read it and what you thought of it or you can delete it from the list once you have read it. There is also a place to tag books with your favourite tag words. There are lots of different ways you can tailor this to suit your individual needs and preferences. You can also choose public or private setting when you create your list, thereby having the ability to share. I hope you take time to try this and have some fun with it! What does a librarian do on vacation? Well, this one visits libraries. Before you think I am a total nerd, that's not ALL I do. But on a recent trip to New England, I found myself in Boston. One stop on the trip included the amazing Boston Public Library. 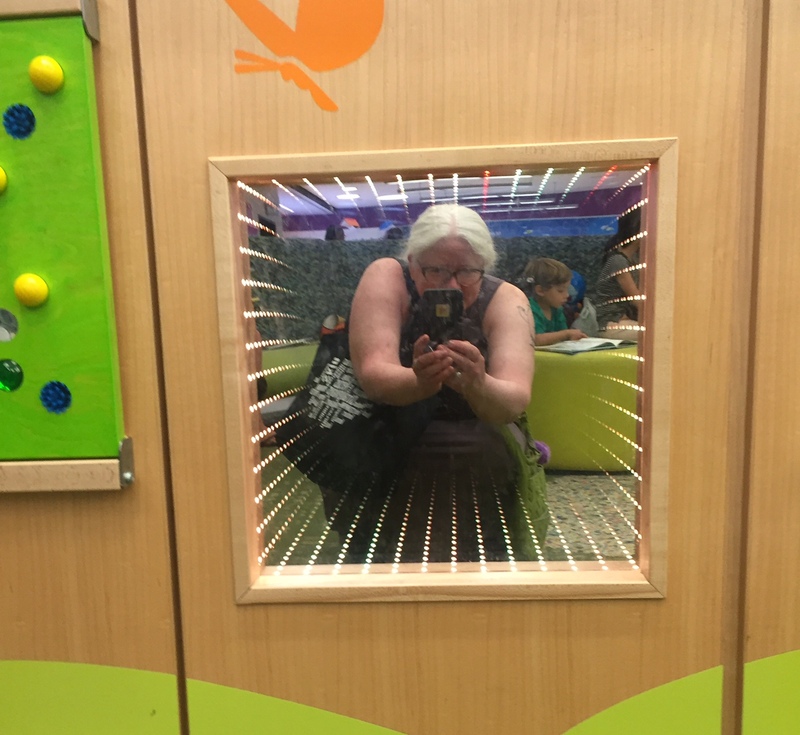 I really wanted to see the newly refurbished Children's area. We are in the process of four (yes, four!) library projects, and so I wanted to get inspiration from the fabulous jewel of a library. I entered through the front, and was led into an open courtyard. This was a PUBLIC library, not a mansion or a museum. Anyone can come in here. Anyone who wants can experience this lovely space. It was built as a "palace for the people". What a gift to Boston. Yes, I was amazed. But I had to head upstairs to the Children's area. I was suitably impressed. The small shelf, with a space for kids to crawl under, was being used exactly for that. I saw a young boy happily crawling under several times. You know that child is going to have happy memories of this library. See that lion on top of the shelf? It has changing LED lights inside. I saw another child standing next to the lion, naming the colours as they changed. How's that for early learning? The colours in this library are so bright! You'd never know you were in an building from 1895. It feels fresh, modern, and has the child in mind in every way. There's a huge chair for story-sharing, and I saw a grandmother and her two grandkids doing just that-- sitting together reading. There's comfy seating everywhere, and even some that kids can move around and use where they want. The whole place was abuzz with kids and their adults, enjoying books and play, and fun! There's an interactive wall, with built-in playscapes and this cool light feature. Adults like the play area as much as the kids do, and here's proof. After soaking in the features of this room, I headed over to the Teen space. Since Margaret Atwood is helping us raise funds for the Kentville teen area, I thought I should get some ideas. The first thing I noticed was the room full of teens hanging out. They were playing games, sitting at a table working on a project, reading, and just hanging out. All libraries need this kind of space, where teens are welcome and know it. Look at that retro READ sign. And the shelves are really nice, with a city-scape feel, appropriate in a downtown library. I was really impressed with this seating area, with decoration made from old card catalog boxes. Beyond you can see some of the adult fiction area, with the vibrant red colour scheme. I didn't even see the rest of the library, as I was due to make an appearance at a graveyard. But that's another story for another day. Let's just say I was impressed, and I can't wait for our libraries to impress you. If you want to help make all our library dreams come true, just visit our "Support our New Library Projects" page! The wood turtle (Glyptemys insculpta) is a medium-sized, semi aquatic turtle, ranging in size from 16 to 25 cm in length. The carapace is gray-brown in colour with a sculptured woody appearance, caused by pyramidial circular rings or growth lines. The plastron is yellow with a pattern of black or dark coloured blotches and has no hinge. The skin on the head and upper body of the wood turtle is often brown, while the skin on the throat, tail and undersides of the legs is often yellow, orange or red in colour. They are a long-lived species, reaching sexual maturity between the ages of 11 to 22. In the wild, wood turtles have an average lifespan of 30 years, compared to 50 years in captivity. Wood turtles in Nova Scotia face a variety of natural and anthropogenic threats. Anthropogenic threats include accidental mortality as a result of vehicles or agriculture equipment, habitat loss and degradation, such as residential and commercial development, forestry practices, water management, and changes in ecological dynamics or natural process, such as subsidized predation (Environment Canada, 2015). In the Annapolis River watershed, which includes extensive road networks and a relatively large amount of land in agricultural production, accidental mortality as a result of collisions with vehicles or farming equipment are significant threats to wood turtles. In Canada, the wood turtle is currently listed as threatened under the Federal species at Risk Act (SARA). The wood turtle was first added to the SARA Registry in 1996 as a species of special concern, and re-examined and listed as threatened in Schedule 1 of SARA 2010. Environment Canada (2015) has determined the recovery of the wood turtle in Canada to be both technically and biologically feasible. In 2015 a draft Recovery Strategy for the Wood Turtle in Canada was released. Once a final Recovery Strategy has been approved, Wood Turtle Action Plans will be posted to the Species at Risk Public Registry. These Action Plans are due for submission by 2020 and will guide conservation actions. In Nova Scotia, the wood turtle was first listed under the Nova Scotia Endangered species act as vulnerable in 2000. After re-examination these designations are largely imparted because of the wood turtle's sensitivity to human activities and land use practices. Since 2012 CARP has been implementing a wood turtle research and stewardship project. The overall goal of the Wood Turtle Monitoring and Stewardship project is to ensure the long-term persistence of the Wood Turtle and its habitat in the Annapolis River watershed. Stewardship plans are a key component of CARP’s wood turtle program. Turtles don’t know the difference between private land, Crown land, protected areas, or any of the other types of land management that humans use. If we want to see this species recover and thrive, we need to work collaboratively with private land owners and managers to ensure that their habitat is conserved. Stewardship plans are based on a property specific assessment; during the assessment areas of habitat, as well as potential threats to habitat or wood turtles are identified. Stewardship plans provide recommendations to address any threats identified, and for maintaining or enhancing habitat. Land use objectives are considered in the planning process, so that recommendations are as feasible as possible. Once a land owner/manager has reviewed the plan and provided any final feedback, a voluntary Stewardship Agreement is signed. These agreements allow CARP to demonstrate public engagement in the species at risk recovery process. On Tuesday September 13 the Lawrencetown Library has kindly agreed to host a Community Wood Turtle Stewardship Meeting in Lawrencetown, from 7:00 – 8:00 PM at the Dr. Frank W Morse Library, 489 Main St., Lawrencetown. This meeting is an opportunity to learn about CARP’s stewardship program. The Village of Lawrencetown has several areas of confirmed wood turtle habitat. There are several turtles known to nest, forage for food, and over-winter in this community. Lawrencetown was Canada’s first community to become certified through Canadian Wildlife Federation’s Backyard Habitat program. We think there is great potential to build on this designation, to ensure that wood turtles are consider in how we use our landscape. By targeting an entire community, CARP hopes to maximize the impact of our stewardship program. Having neighbouring properties all contributing to habitat stewardship will help to ensure landscape level habitat connectivity.